Shown separately here are the two pieces of the cheese dish; the cover and the stand. 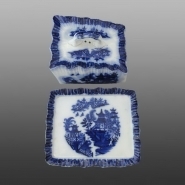 An extensively molded ironstone covered cheese dish printed in flow blue with the Worcester Willow pattern. Wiltshaw & Robinson marketed wares like this piece under the trade name "Carlton Ware". The mark includes the Registration Number 213522 which was issued during the year 1893.